The empirical evidence is expressed in terms of the relationships between measures of risk management implementation and measures of company performance, usually based on financial indicators. It is important to recognise that the fact that one of these measures is strong when the other is strong does not necessarily mean that one causes the other. It might be that they are correlated rather than being in a cause-effect relationship. Organisations that have seen benefits flow from an investment in business process improvement are more likely to have the confidence to invest in further improvement, driving a wider range of performance enhancements that will often include ERM. There seems to be little empirical evidence about the specific reasons for the correlations that are observed although many people will express an opinion on the subject. This paper offers guidance on what to consider as an organisation makes up its own mind about whether to devote resources to ERM and how to go about it. This note does not discuss the contribution of sound risk management processes to projects and programs. We shall address the evidence for that separately. The references section below details the source material on which we have drawn when compiling this guidance note. A summary of the sources and their findings is provided in Table 4 at the end of this note. The term ERM is often used loosely. The work described here is mainly concerned with organisations that have, or aspire to have, an explicit risk management focus. Several measures of ERM effectiveness have been used. Presence or absence of ERM: Several studies have used content analysis of company annual reports, analyst reports and financial media to determine when terms like ‘risk’ were first used in relation to a company. This approach has the advantage that only publicly available information is needed. 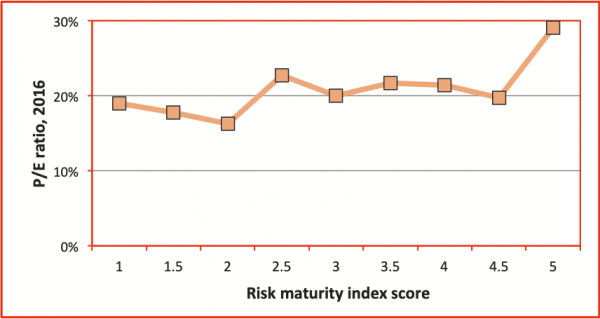 Risk management maturity: Many studies have used some measure of risk management maturity, often based on formal maturity assessment models. For example, Table 1 shows the attributes that are used to compile the Risk Management Maturity (RMM) score by the Risk and Insurance Managers Society (RIMS), with each attribute being aggregated from a set of related components. 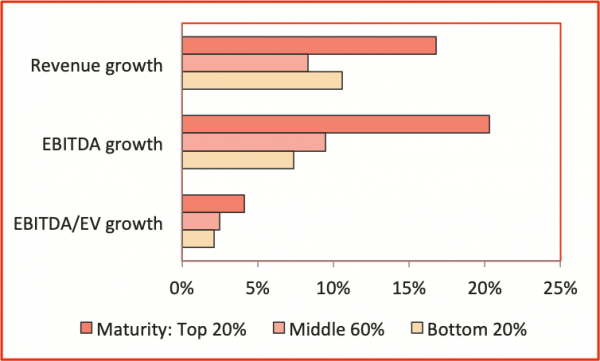 There are several comparable maturity models in widespread use. Those researching the value of ERM have used many measures of business performance. Financial metrics: Many of the metrics are based on financial indicators such as revenue, earnings before interest, tax, depreciation and amortisation (EBITDA), net profit, share price and so on. Often the specific measure is based on cumulative growth in the indicator, or its variability or volatility. Financial metrics have the advantage of relying on publicly available information, at least for listed companies. Survey data: Some studies have used perceived business performance based on survey information rather than pre-existing data (e.g. Annamalah et al, 2018; Gates et al, 2012). Value metrics: Many studies have used Tobin’s Q, sometimes called the Q ratio, as a measure of company value. Tobin’s Q is defined as the ratio of the total market value of the company divided by its total asset value, so it provides an estimate of whether the company is undervalued or overvalued. Annamalah et al (2018) used a different metric, economic value add, which is defined as net operating profit after tax, less total capital multiplied by the cost of capital; EVA = NOPAT – TC*WACC. 'Best-in-class’: Another strand of analysis examines ‘leading companies’, where a leading company shows better performance across a range of financial and operating measures, aggregated in some way that seems appropriate for the business sector of interest. Several authors have shown that simply having a risk management process of some kind, based on content analysis of reports, correlates with improved business performance. Quon et al (2012) found no statistically significant association between risk assessment and company performance for 156 non-financial companies listed in Toronto, but their data was derived for a time period (2007-09) that covered a major financial crisis during which the performance of companies might have been unstable for many reasons, masking the systematic effect of any particular business process. 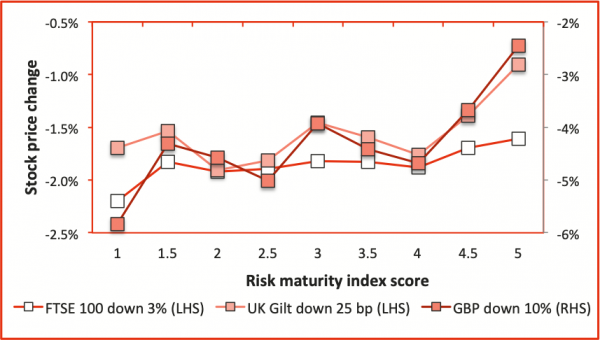 Using a measure of risk management maturity allows more refined analysis. Several studies have adopted this approach. McShane et al (2011) observed a positive relationship for 82 publicly listed insurance companies between Standard and Poor’s ERM ratings and company performance measured by Tobin’s Q. The relationship was stronger at lower ERM ratings than for higher ratings. Ernst & Young (2012) showed that compound annual growth rates in revenue, EBITDA and EBITDA/EV over the period 2004 to 2011 were higher for companies with the most mature risk management (Figure 2). FERMA (2012) found that companies with advanced ERM practices generate stronger EBITDA growth than those with weaker ERM; 28% of companies with advanced ERM had growth over 10% compared with 16% of companies with emerging practices (Figure 3); among companies with an EBITDA growth over 20%, 74% had mature or advanced risk management practices. In a survey of 150 companies, Gates et al (2012) observed a significant positive correlation between perceived risk management capability and perceived business performance. In a survey of 81 insurance brokerage clients, Aon (2017) showed that higher risk maturity scores correlated with higher stock price performance (Figure 4) and market valuation expressed as a price/earnings ratio (Figure 5). In a sample of 15 oil and gas companies in Malaysia, Annamalah et al (2018) showed a significant correlation between implementation of ERM and improved business performance measured in terms of economic value add. Farrell and Gallagher (2015) identified a strong correlation between ERM performance and financial performance. Companies in the top tiers of ERM maturity (levels 3-5) were associated with an increase in value of about 25% compared to those in the lower tiers (levels 1-2). They also identified the contributors in the Risk and Insurance Management Society (RIMS) Risk Maturity Model (RMM) that contributed most to the effect of sound ERM on company value (Figure 6, Table 1). Several studies have shown that good risk management practices are associated with more consistent financial outcomes, expressed as lower earnings volatility and lower share price volatility. FM Global and Oxford Metrica (2010) showed that large multinational companies with strong property management processes had far lower earnings volatility than those with weak practices (Figure 7). 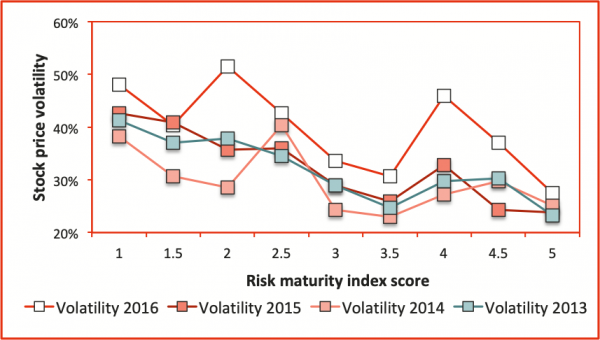 Aon (2017) showed higher risk maturity correlates with lower stock price volatility (Figure 8). 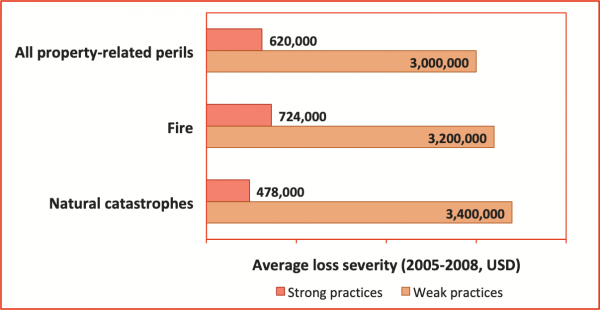 FM Global and Oxford Metrica (2010) found that companies with strong property risk management processes suffered fewer and less severe property losses (Figure 9). Using the Bloomberg Scenario Function, Aon (2017) showed that a higher risk maturity score correlated with improved resilience to market shocks expressed in terms of smaller share price reductions in the immediate aftermath of a simulated market event (Figure 10). Note that the vertical axis represents negative values; a change in the currency generates a much larger change in market price, so this effect is shown on the right-hand axis. Aon (2017) found that 10% increase in a company’s Risk Maturity Index (RMI) score was associated with direct reductions of 2.6% in Directors and Officers (D&O) insurance premiums compared to similar companies, after controlling for other related factors. Taking into account other indirect premium benefits that flow from reduced volatility, the premium reduction was 3.8%. Figure 11 shows how a 10% improvement in scores in some of the characteristics used in Aon’s RMI are related to direct D&O premium reductions (excluding the indirect effects of volatility). Aon’s RMI includes components specifically related to insurance; unsurprisingly, these are associated with significant beneficial effects. These results align with the maxim that the best companies don’t buy insurance, they sell risk. 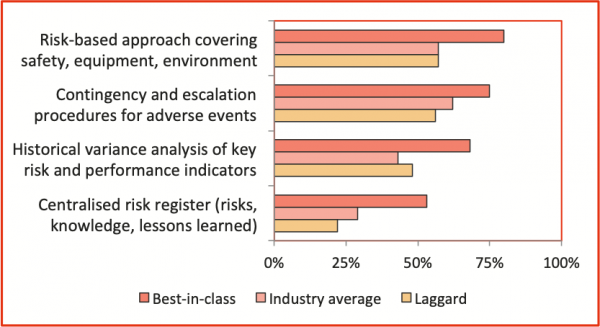 Aberdeen (2013) showed that best-in-class manufacturers demonstrated better operational risk management practices (Figure 12). They also integrated their risk management information systems with other systems, analytics and dashboards (Figure 13), ‘to more easily get the “big picture” view of the state of their manufacturing operations – where the biggest risks lie – and most importantly where they should focus their efforts.’ They showed similar outcomes in a later study, Aberdeen (2016). 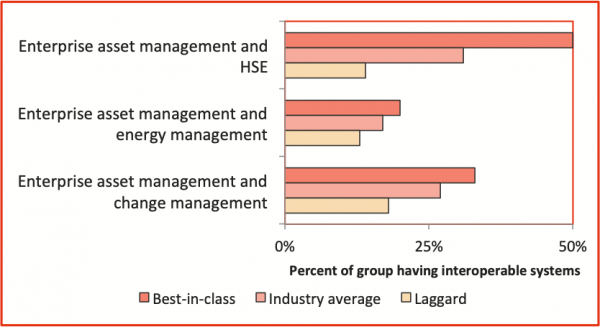 Based on the experience of over 175 respondents, Aberdeen (2015) showed that leading energy companies are far more advanced than energy followers on most risk management metrics (Figure 14). For this study, energy companies included organisations engaged in fuel extraction, manufacturing, refining, independent production (solar, wind, fuel cells, nuclear etc.) and distribution. Table 2 shows our view of some of the business benefits of risk management and the factors that help to generate them. Table 3 outlines some of the characteristics of the way we in Broadleaf approach our consulting work when we advise organisations on how they might enhance their risk management practices, with an indication of how the way we work adds value. Aberdeen Group (2013) Operational risk management: How best-in-class manufacturers improve operating performance with proactive risk reduction. Aberdeen Group, Waltham MA, USA, March. Aberdeen Group (2015) Powering the energy industry of the future by mitigating risk. Aberdeen Group, Waltham MA, USA, February. Aberdeen Group (2016) Optimizing organizational performance with operational risk management. Aberdeen Group, Waltham MA, USA, August. Annamalah, S, M Raman, G Marthandan and AK Logeswaran (2018) Implementation of enterprise risk management (ERM) framework in enhancing business performances in oil and gas sector. Economies, 6(1), 4. 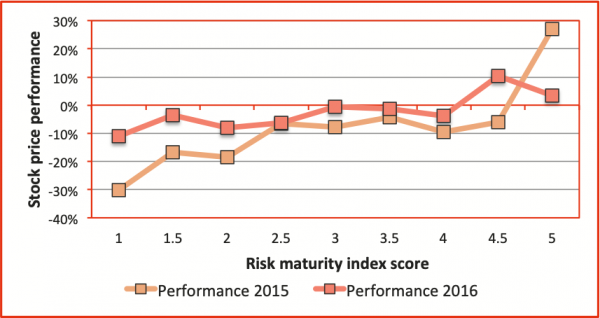 Aon (2017) Aon risk maturity index. Aon plc, Insight Report, October. Beals, S, C Fox and S Minsky (2015) Why a mature ERM effort is worth the investment. Risk and Insurance Management Society. Ernst & Young (2012) Turning risk into results. Ernst & Young, ey.com. Farrell, M and R Gallagher (2015) The value implications of enterprise risk management. Journal of Risk and Insurance, 82(3), 625-657. 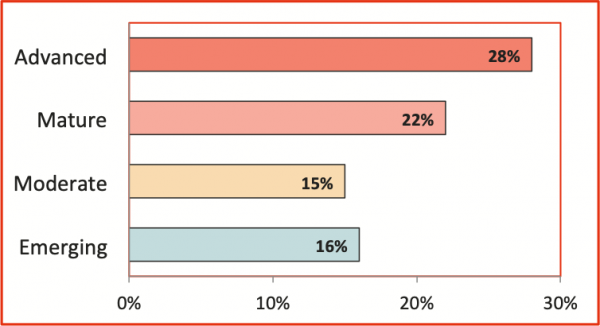 FERMA (2012) FERMA European Risk Management Benchmarking Survey 2012. Federation of European Risk Management Associations. FM Global and Oxford Metrica (2010) The Risk/Earnings Ratio: New Perspectives for Achieving Bottom-Line Stability. FM Global, Johnston RI, USA. Gates, S, J-L Nicolas and PL Walker (2012) Enterprise risk management: A process for enhanced management and improved performance. Management Accounting Quarterly, 13(3), 28-38, Spring. Hoyt, RE and AP Liebenberg (2011) The value of enterprise risk management. Journal of Risk and Insurance, 78(4), 795-822. Kommunuri, J, A Narayan, M Wheaton, L Jandug and S Gonuguntila (2016) Firm performance and value effects of enterprise risk management. New Zealand Journal of Applied Business Research, 14(2), 17-26. Nocco, BW and RM Stulz (2006) Enterprise risk management: Theory and practice. Journal of Applied Corporate Finance, 18(4) 8-20, Fall. McShane, MK, A Nair and E Rustambekov (2011) Does enterprise risk management increase firm value? Journal of Accounting, Auditing and Finance, 26(4), 641-658. Quon, TK, D Zeghal and M Maingot (2012) Enterprise risk management and firm performance. Procedia – Social and Behavioral Sciences, 62, 263-267. Rodrigues da Silva, J, A Fernandes da Silva and BL Chan (2019) Enterprise risk management and firm value: Evidence from Brazil. Emerging Markets Finance and Trade, 55, 687-703. The detailed contents of Table 4 are not included here. They can be found in the pdf version of the tutorial, available here.